As a demonstrator, I have the benefit of being able to get new products early, and all week I have been playing with some new products from the upcoming catalog. Let me tell you, you are going to love the new catalog! However, I am saving my projects to share with you in June while I am in Taiwan (as I won't be getting much stamping in there). So stay tuned! For now, I revisited one of my favorite stamp sets, Six Sided Sampler, and I want to share those cards with you today and next week. I challenged myself with these cards to only use one ink pad, Smoky Slate. It was difficult, but the results ended up being great! This card in particular is super, super, super simple! The combination of Smoky Slate, Daffodil Delight, and Whisper White is classic and easy to pull off. I started off by stamping the hexagon three times as a base to build my focal point on. A couple of banners from the Polka Dot Parade Designer Series Paper and Vellum Card Stock were my next step to add interest. 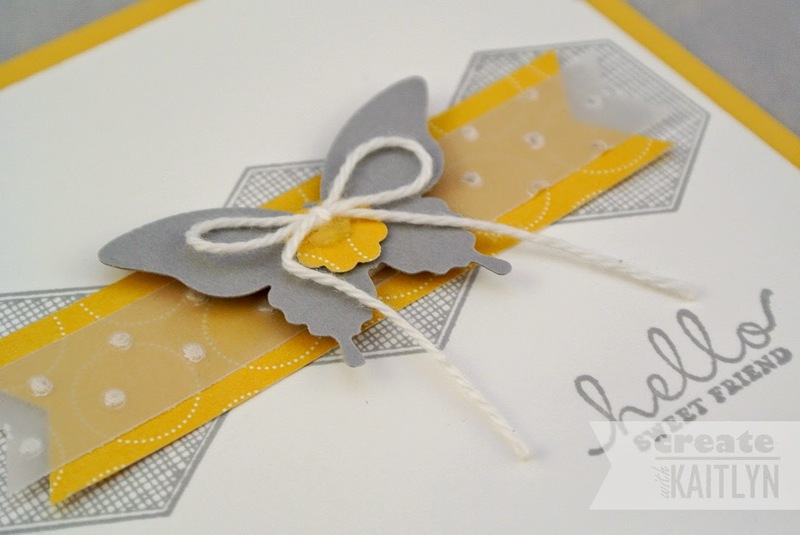 The focal point was quick to make with the Elegant Butterfly Punch and Itty Bitty Punch Pack. A White Baker's Twine bow was the perfect touch to finish this card.